Amending RPA (Bill No. LXII 2013): Can It Be the Last Stand? This post is going to pose a question rather than seek to answer one. Two independent civil petitions, namely *WRIT PETITION (CIVIL) NO. 490 OF 2005* and *WRIT PETITION (CIVIL) NO. 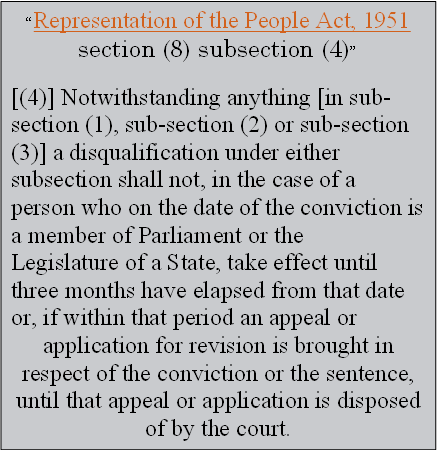 231 OF 2005*, had challenged the Constitutional validity of subsection (4) section (8) of Representation of the People Act, 1951. A Supreme Court two judge bench on 10thof July 2013 delivered a verdict that held the subsection (4) in question ultra vires of the relevant Constitutional provisions. The reasons why SC held it is ultra vires was twofold. 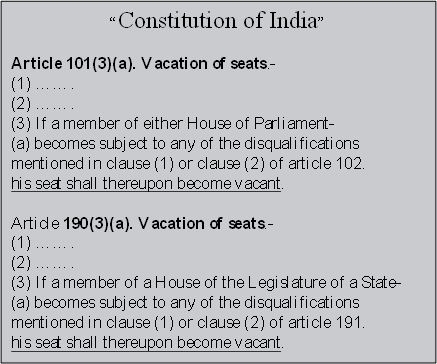 First, Articles 102(1)(e) and 191(1)(e)of the Constitution that confer power on the parliament to make laws regarding *disqualifications* related to candidates (electors) for elections to and existing (already elected) members of parliament and state legislatures, circumscribe that power by explicitly stating identical laws must be made for them. 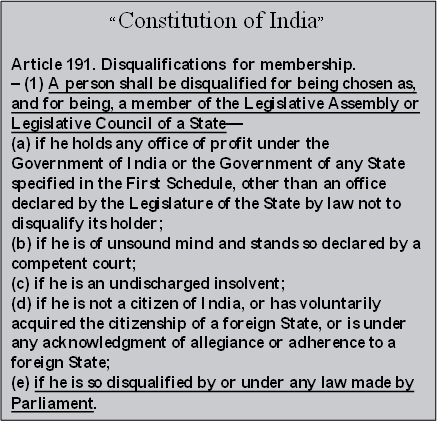 That is disqualification law must be the same for a person to be elected a member of Parliament or a State Legislature and for a sitting member of a House of Parliament or a House of a State Legislature. Therefore, there cannot be a more relaxed law for sitting members than candidates in an election. Second, Articles 101(3)(a)and 190(3)(a), *expressly forbid* parliament to defer the datefrom which the disqualification will come into effect in case of a sitting member of Parliament or a State Legislature. The subsection (4) was precisely inserted to allow such deferment, which is prohibited by the Constitution. Executive was quick to appeal to the SC through a review petition to set aside the above judgment. However, without waiting for the outcome, it rushed a bill in the current monsoon session of parliament to amend subsection (4) section (8) of the Representation of the People Act, 1951. The amendment was moved in August 2013, but the amended act is to be effective retrospectively from 10th July, when the SC verdict was delivered.Further it adds, that the amended law is to be treated for all legal, judicial, and administrative purposes as if it has always existed in *material times*. Not surprisingly, the bill got support from across the political spectrum with not a single party or a member seriously opposing it. Why is it not surprising? Because over 30% of Parliament and States Legislatures’ members have serious criminal cases either pending against them or have stayed sentences/convictions, which they are fighting in the court of law. One of the houses has already passed the amendment bill. The amendment itself is simple; the question is whether it is effective, at least by itself. Earlier, a sitting member’s disqualification was automatically stayed for 90 days after the date of conviction; that is for the *statutory period* provided in law to appeal or apply for revision to appellate court. This position will continue unaltered under the amended subsection too. Had the convicted member appealed or applied for revision within this statutory limitation period, then the disqualification remained inoperative until the appellate court disposed of his appeal or application for revision. If the first appellate court was a High Court, then similar situation presumably continued, if conviction was confirmed, and member chose to appeal or apply for revision to apex court. Until the apex court gave its verdict, the member could function fully and exercise all his rights and privileges as if nothing had happened to him despite the conviction and sentence hanging over him like the proverbial Damocles sword. Considering the unending backlog and inordinate delays in our judicial system, this state of affairs practically meant that such a convicted member would complete his full term of five years technically unmolested by the conviction. This sorry state has changed somewhat after the amendment. First, the member has to not only appeal or apply within 90 days after conviction date, but must obtain stay either of the conviction or the sentence within the same 90 days period. This puts additional burden and anxiety on the convicted member, but is hardly insurmountable as most members can afford to engage the services of reputed and influential lawyers who would be expected to deliver by the stated deadline. Second, the convicted member stands emasculated because he would not be allowed to voteand would lose his salary or allowances until his conviction is overturned by the appellate court. However, I suppose, the recourse to apex court would be available to him as before mutatis mutandis. A non-voting member is of little value to his party, whether in power or in opposition, especially in the era of coalition politics and of wafer thin majorities. They why this alacrity? Here, such convicted and emasculated member works as a positional peg so that the particular seat held by him doesn’t fall vacant. In short, under this revised dispensation, the current voting arithmetic of a house is affected only by ‘1’ and not by ‘2’ as would happen if the convicted member were to lose his seat immediately and in the reelection the opposite party candidate were to win it. Was all this rigmarole worth it for such a miniscule advantage? Part-II of the Representation of the People Act, both before and after this amendment, deals with qualifications and disqualifications of the elected members of Parliament and State Legislatures. The qualifications (sections 3, 4, 5, 5A, and 6) with all their specific variants with respect to scheduled castes and tribes or specific State-Legislatures do not specify if the candidate for an election to Parliament or Legislature should be free of any conviction, or if convicted his conviction or sentence should have been stayed at the time of filing his nomination papers. Chapter IV of Part II lays down grounds for disqualification as a Voter. Every elector (candidate) is mandated to qualify as a voter and be on the voter list of a Parliamentary or a Legislature Constituency as the case may be in Chapter I and Chapter II of Part II respectively. 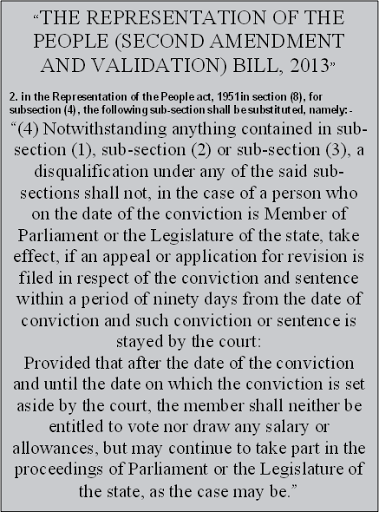 However, Chapter IV doesn’t provide to the *voter* same ^remedies of protection from disqualifications^ as were or are made available to the *Member of Parliament or State Legislature under sub-section (4) section (8) of Chapter III either before or after the amendment. Since every elector has to qualify as a voter, an Elector (or Candidate) for a Parliament or State Legislature election suffers a disadvantage on this count when compared to the position of existing Member of a Parliament or a state Legislature. This was precisely one of the two grounds on which section (8) sub-section (4) was held ultra vires of the Constitution. 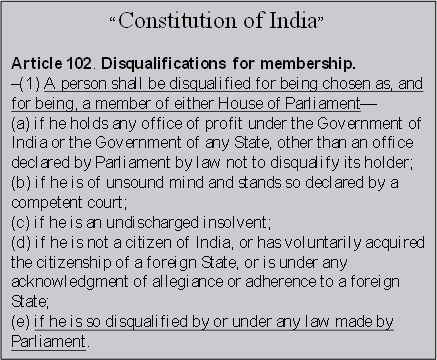 The other ground was that Constitution expressly forbids any deferment of disqualification of any Member once he is convicted by the trial court: (If a member of either House of Parliament- (a) becomes subject to any of the disqualifications mentioned in clause (1) or clause (2) of article 102 OR If a member of a House of the Legislature of a State- (a) becomes subject to any of the disqualifications mentioned in clause (1) or clause (2) of article 191), his seat shall thereupon become vacant. Question therefore now arises as to what exactly has been achieved through this amendment? Any takers?